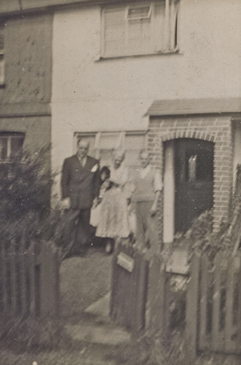 Herbert and Ivy Musgrove while running the boarding house at 28 Highbury Hill had been looking for a weekend retreat in the countryside since about 1946. After plans to purchase a cottage in Old Amersham fell through, the couple purchased Lee Cottage in the village of Radnage Buckinghamshire. The photographs above were taken shortly after Herbert & Ivy moved in. 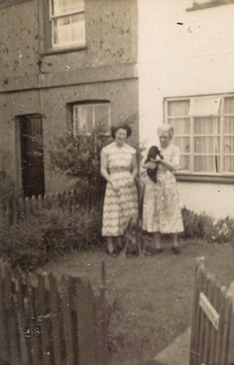 On the left Ivy is shown holding her pet spaniel Sue with her daughter Peggy. On the right Ivy is joined by her husband Herbert and her brother Walter Harris. 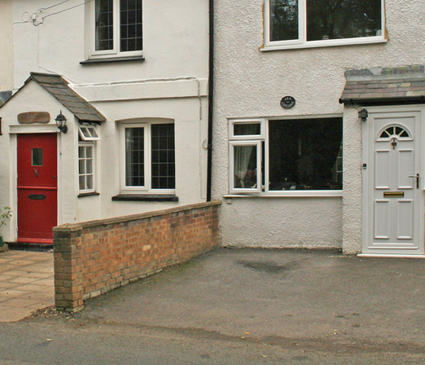 The centre picture shows Lee cottage present day. Note the various changes that have occurred over the last 60 years. The small grass front garden with it's wooden fence and gate have been replaced by a featureless concreted over car park area. The windows both upstairs and downstairs have been changed and the porch updated. The house next door has had replacement windows and a modern porch extension. The map below shows part of Radnage. Lee Cottage is located in the part known as The City, on the north side of the road above the letter 't' in City.